US Dollar: March USD is Up at 97.015. 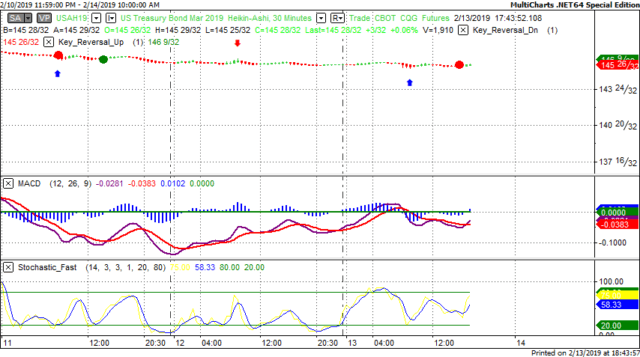 Energies: March '19 Crude is Up at 54.44. Financials: The Mar 30 year bond is Up 6 ticks and trading at 145.30. Indices: The Mar S&P 500 emini ES contract is 22 ticks Higher and trading at 2757.00. Gold: The Feb Gold contract is trading Down at 1309.10. Gold is 60 ticks Lower than its close. This is not a correlated market. The dollar is Up+ and Crude is Up+ which is not normal and the 30 year Bond is trading Higher as well. The Financials should always correlate with the US dollar such that if the dollar is lower then bonds should follow and vice-versa. The S&P is Higher and Crude is trading Higher which is not correlated. Gold is trading Lower which is correlated with the US dollar trading Higher. I tend to believe that Gold has an inverse relationship with the US Dollar as when the US Dollar is down, Gold tends to rise in value and vice-versa. Think of it as a seesaw, when one is up the other should be down. I point this out to you to make you aware that when we don't have a correlated market, it means something is wrong. As traders you need to be aware of this and proceed with your eyes wide open. At this hour all of Asia is trading Lower with the exception of the Singapore exchange which is fractionally Higher. Currently Europe is trading Higher with the exception of the Milan exchange which is trading Lower. Retail Sales is out at 8:30 AM EST. This is major. Core Retail Sales is out at 8:30 AM EST. This is major. PPI is out at 8:30 AM EST. This is major. Core PPI is out at 8:30 AM EST. This is major. Business Inventories are out at 10 AM EST. This is major. 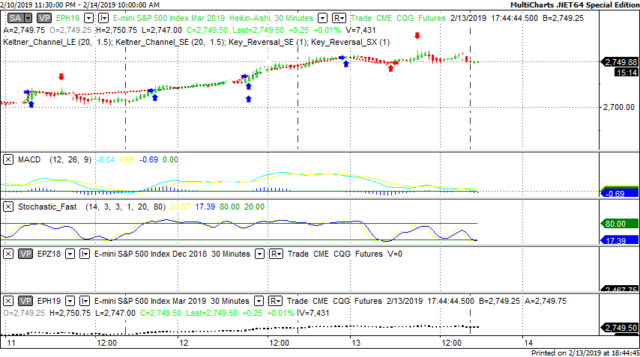 Natural Gas Storage is out at 10:30 AM EST. This is major. Mortgage Delinquencies - tentative. This is major. Yesterday we gave the markets a Downside bias as both the USD and the Bonds were trading Higher Wednesday morning. The markets however had other ideas as the Dow gained 118 points and the other indices gained ground as well although fractionally. Today we aren't dealing with a correlated market and our bias is Neutral. Yesterday morning we gave the markets a Downside bias but perhaps we should have given a Neutral bias however the USD and the Bonds were trading Higher and that usually reflects a downside day. What changed? News that an impending trade deal with China may be consummated. That kind of news has the ability to turn the markets around as it did yesterday. Today we have 8 economic reports all of which are major.. On a lighter note, please don't forget that today is Valentines Day and your romantic interest is expecting something so don't disappoint them. Trading performance displayed herein is hypothetical. The following Commodity Futures Trading Commission (CFTC) disclaimer should be noted. In fact, there are frequently sharp differences between hypothetical performance results and the actual results subsequently achieved by any particular trading program. One of the limitations of hypothetical performance trading results is that they are generally prepared with the benefit of hindsight. In addition, hypothetical trading does not involve financial risk, and no hypothetical trading record can completely account for the impact of financial risk in actual trading. For example, the ability to withstand losses or to adhere to a particular trading program in spite of trading losses are material points which can also adversely affect actual trading results. Trading in the commodities markets involves substantial risk and YOU CAN LOSE A LOT OF MONEY, and thus is not appropriate for everyone. You should carefully consider your financial condition before trading in these markets, and only risk capital should be used. In addition, these markets are often liquid, making it difficult to execute orders at desired prices. Also, during periods of extreme volatility, trading in these markets may be halted due to so-called “circuit breakers” put in place by the CME to alleviate such volatility. In the event of a trading halt, it may be difficult or impossible to exit a losing position.